Stuart Carson Successfully Defended his PhD in December of 2018! Congratulations to Stuart Carson for successfully defending his PhD thesis titled Spatial and Spatio-Temporal Models for Use in the Marine Environment with Applications to the Scotian Shelf. 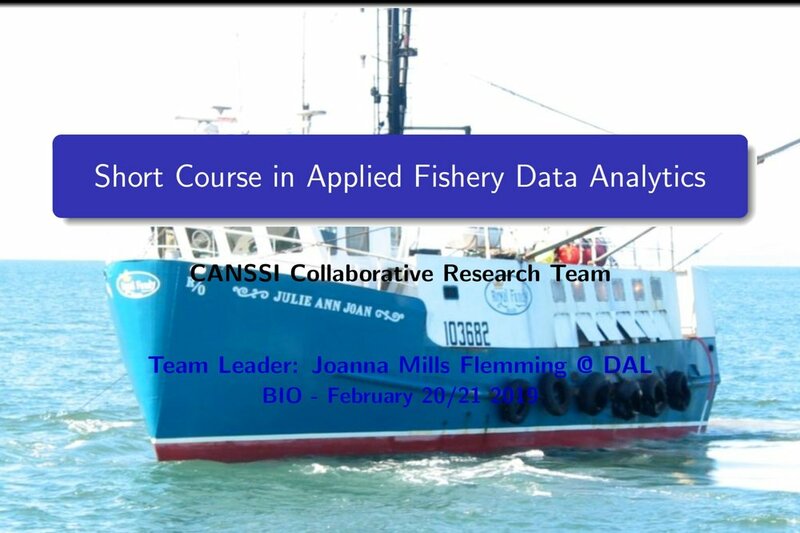 On February 20/21, I led the CANSSI Collaborative Research Team to give two-day short course on Applied Fishery Data Analytics at Bedford Institute of Oceanography. The short course was well-received, and interesting discussions were inspired. Ethan Lawler is Awarded the 2018 Vanier Scholarship! I am happy to announce that my doctoral student, Ethan Lawler, has been awarded a 2018 Vanier Scholarship! I just returned from the IBC biennial meeting in Barcelona, Spain! Click here to learn more about IBC! On Tuesday, 10 July, I gave my invited talk titled Robust and Consistent Estimation for General State-Space Models with Application to Problems in Fisheries Science and Movement Ecology. Inaugural Meeting and Year 1 Workshop of CANSSI CRT Takes Place in Montreal! The meeting is focused on "Towards Sustainable Fisheries: SSAMs for Complex Fisheries and Biological Data". Congratulations to my nephew Alex Burke on graduating with a degree in civil engineering this morning! Happy to be in Toronto to participate in the workshop and discuss data science challenges with researchers, industries, public and not-for-profit organizations. On Saturday, April 7, The Globe and Mail published a long article on advances in counselling and therapy around mental health—“Rethinking therapy: how 45 questions can revolutionize mental health”. The punch line? A new emphasis on data collection and analysis is helping therapists to track patients’ progress, alert them to troubling trends, give patients affirmation with their progress, and more. The use of these data collection efforts have been validated by clinical trials. Data collection and clinical trials have informed medical practice for chronic and acute diseases for more than seventy years. On the same day in the financial pages an article on the use of personal data by banks and credit unions highlighted renewed attention to privacy — not surprising in the wake of the Facebook crisis—“RBC chief executive calls for stronger protections for consumer data”. Statistics Canada has been collecting Canadians’ data for 100 years and has never had a data breach. How do they manage this? Through a carefully focussed, unwavering attention to the importance of privacy and the ongoing development of statistical science and infrastructure to advance this goal. In the health pages, we read that new research published in the American Journal of Clinical Nutrition reported the analysis of “44 previously published high-quality studies involving 1,082,092 participants”—“Anti-inflammatory diet may guard against cancer”). Nutritional studies rely on what statistical science calls meta-analysis, or study of studies: this leverages the information in similar investigations from around the world to increase our knowledge, and our confidence in this knowledge. An opinion piece on Canada’s seaports referred to looming environmental risks and safety risks, as well as risks from security breaches: “security threats are uncertain because we do not have reliable data to understand the scope of the problem” — “Canada port authorities need a new culture of security”. The study of risks from threats ranging from climate change, sudden storms, automobile accidents, security breaches, and much more, is underpinned by statistical modelling. You don’t find statistical scientists quoted in any of these articles, but they are there. Statistical science underpins the collection of data, the summarization of data, and the advance of knowledge in the face of uncertainty. Where are these hidden statistical scientists in Canada? Everywhere. They work for the government, in industry, in universities, for banks, tech start-ups, tech titans, in manufacturing, drug development, libraries and labs. Research in statistical science underpins artificial intelligence, medical decision making, business strategies, climate studies, academic fields from agriculture to zoology and everything in between. The April 7 issue was not special in featuring stories based on statistical science—statisticians have been teaching Statistics in the News for more than 20 years. Every article in the scientific literature that relies on statistical analysis has a statistician on the team or has been reviewed by a statistician—regulatory agencies require this, as does every major science publisher. What has changed is the ubiquity of data and a new recognition of the challenges in turning data into knowledge. 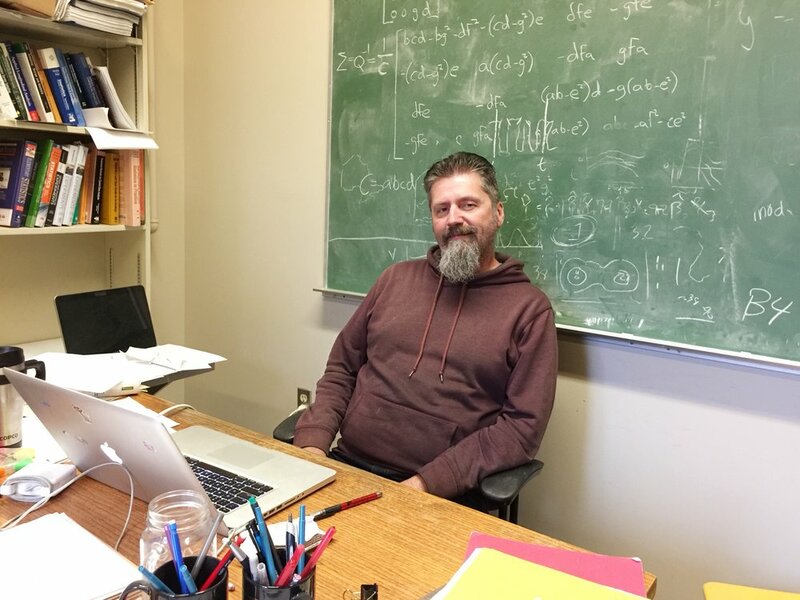 The students have noticed—the number of students choosing statistical sciences programs at the University of Toronto has quadrupled in less than five years and increased from 2800 to 3500 in the past year alone. This exponential growth is being experienced across the country and indeed around the world. Employers have noticed—the demand for graduates able to converse with data and communicate with humans are coming from all sides, and a new group of employees, who help senior managers and policy makers turn data into action is now as important as the communications department. The new field of data science, which draws on statistics, mathematics and computer science, has developed as a response to this data revolution. Investments in all aspects of data science are being made around the world. The Alan Turing Institute for Data Sciencein the UK was launched in 2015 with a 42-million-pound government investment. The National Science Foundation anticipates investing 12 million (US) in a network of Data Science Institutes, for trans-disciplinary study of the foundations of data science. A national effort that bridges the main funding agencies and advances the science of data is badly needed. When will the research funding agencies in Canada notice? Nancy Reid, OC, FRSC, is Professor of Statistical Sciences at the University of Toronto and Director of the Canadian Statistical Sciences Institute (CANSSI). This summer, Soapbox Science will take place in Halifax at the Halifax Seaport Farmers’ Market. Twelve scientists are invited to give talks about subjects across Science, Technology, Engineering, and Mathematics (STEM). The audience will be introduced to careers in STEM, and see how STEM contributes to the advancement of life and technology. I will give a talk on “How can we count fish in the sea?". Statisticians are making meaningful contributions to important research projects in ecology and the environmental sciences. The purpose of the Canadian Statistical Sciences Institute (CANSSI) is to advance research in the statistical sciences in Canada by attracting new researchers to the field, increasing the points of contact among researchers nationally and internationally, and providing assistance to collaborations with other disciplines and organizations. I am the Team Leader for one of the first three Collaborative Research Team projects awarded by CANSSI, titled "Advancements to State-Space Models (SSMs) for Fisheries Science." The Ocean Tracking Network (OTN) is a 7-year research program making use of technologies and infrastructure to understand changing marine ecosystems and demonstrate how we can learn about continental shelf ecosystems through cutting-edge research. This program is enabled by the largest federal government university research award, in Dalhousie University and Atlantic Canadian history, with investment from CFI, NSERC and SHHRC as well as from in-kind and financial contributions from OTN partners worldwide. As part of this program, I am a Co-Investigator (with 28 others) on a research grant (obtained via the NSERC Research Partnerships Program) titled “Understanding Species Movements, Interactions, and Environmental Variability across Canada’s three Oceans”. Understanding how animals interact with a dynamic ocean environment is critical not only for conservation and resource management but also for gaining novel insight into the nature of species interactions. I am currently developing statistical modelling and visualization tools for complex OTN datasets which is a high priority goal of OTN. OFI is built on world-class Canadian university expertise of Dalhousie, Memorial University of Newfoundland and the University of Prince Edward Island, together with eight international partners including four of the top five ocean institutes in the world as well as partners in the Government of Canada’s federal laboratories, the Royal Canadian Navy, the National Film Board of Canada and national and international industry. $94 million in funding has been awarded through the Government of Canada’s Canada First Research Excellence Fund (CFREF) to support the Ocean Frontier Institute, the largest grant in the history of the three Canadian partner universities. OFI has also attracted an additional $125 million in support from provincial governments and partners, including a gift of $25 million from Mr. John Risley, prominent business leader, entrepreneur and philanthropist. This massive total investment of $220 million dollars is unprecedented in Canada’s ocean science sector. I am a Team Member for various Modules being funded through the CFREF. Congratulations to the Flemming Family!